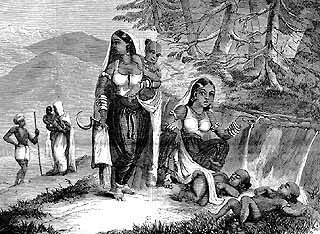 "The accompanying sketch exhibits a scene of daily occurrence in India, in the lower range of the Himalayas between Simla and the plains. It refers to the custom which is adopted by the women to lull their children to sleep, so that, while wrapped in slumber, they may themselves be able to go forth either to labor on the road or assist in the cultivation of small patches of ground that, by an ingenious amount of terracing, enables the hill-man to rear grain for the few inhabitants who have their tiny homes, or hovels, perched upon every accessible space suitable for the safe erection of a domicile. "Springs of water are abundant, and near one of these, where it flows in a silvery stream, on a ledge or field immediately beneath it, the children, from even a month old to three or four years of age, are brought and laid down. By means of a small piece of slit bamboo a slight flow of water is obtained from the stream, and the bamboo slip is so adjusted that the water falling from above alights on the well-shaven crown of the child and trickles off: thus the child falls asleep, and the unceasing flow of water on its head keeps up a perpetual lullaby: and so, for hours and hours the most refractory infant is quieted and left without apprehension by the mother, who, when her work is over, returns to the spot, hoists up her child on to her hip, and sallies home. "A more picturesque scene that what is occasionally exhibited by this daily performance is scarcely to be met with in the East, and forms one of the most characteristic and striking pictures that gratify the traveler in the Himalayas. "We are not prepared to recommend the example to those of our American fellow-countrywomen who have troublesome babies; but the custom is curious and interesting."